Remove leaves quickly: It is important to keep up with leaf removal on your lawn. Too many leaves will prevent sunlight and air from reaching your grass, which is especially a problem when you are reseeding or over-seeding. Be sure to rake leaves frequently and dispose of according to your township’s recycling efforts. By the time winter comes around and your grass is going into dormancy, you will want to get the remainder of the leaves off your lawn. Large amounts of leaves left on your grass will often mean that you are reseeding the areas underneath in the spring because they died from lack of air, sunlight, and too much moisture. Mow your lawn shorter (but not too short): The general rule of thumb for mowing your grass is to cut shorter in the spring and fall and higher in the summer. The best way to think of this is that what you see above the ground, often represents the length of the roots beneath the ground. 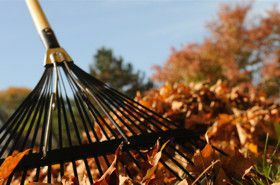 After the summer, you should look to reduce the height of your lawn so that it will dry out better during periods of rain and snow, and will make for raking of the leaves easier. Cut your grass shorter, but no shorter than 2 inches. Fertilizer with fall food (winterizer): After feeding all spring and summer, we often are asked if fall food is really necessary. It is not necessary, but certainly a recommended step by all major lawn care experts/companies. Late October and early November is a great time to apply your last dose of fertilizer. Feeding this late in the season will help the grass fill in from the tough summer. It will also provide the roots with nutrients that are stored until the spring so that it can get a good, healthy start next year. Fall foods such as Jonathan Green’s Winter Survival and Scotts WinterGuard are great options right now. WinterGuard can be found with or without weed control. Fall is the best time to seed: Since we didn’t experience a prolonged drought this summer, the need to seed this fall seems to be less than in years past. However weeds, fungus, and insects have still done their number on our lawns. If you have some areas that are not bouncing back this fall, then those areas are going to need seeded before weeds begin to invade. Late October and Early November are still great times to seed, since the ground is still warm enough and there is frequent rains. Both of which will help your grass seed germinate quickly. If winter comes early and the seeds don’t have time to fully germinate, don’t worry, what is left will sprout in the spring once the temperatures warm up again! Consider soil amendments: Fall is a great time of the year to apply soil conditioners, such as Jonathan Green’s Love your Lawn, Love your Soil, to help breakdown clay soils. Core aeration can also be considered to help loosen your soil for nutrients and oxygen to reach the grass roots. Likewise, if you often fight moss in early spring, applying a pelletized lime or a fast-acting calcium-based lime (such as Jonathan Green’s Mag-i-cal) in the fall can greatly reduce the amount the presence of moss next year. If you are unsure the pH level of your lawn and whether lime is needed, we recommend you stop in for a soil test kit, which are an inexpensive way to know if you need to apply lime and how much.